HRL Laboratories, LLC, has made a breakthrough in metallurgy with the announcement that researchers at the famous facility have developed a technique for successfully 3D printing high-strength aluminum alloys—including types Al7075 and Al6061—that opens the door to additive manufacturing of engineering-relevant alloys. These alloys are very desirable for aircraft and automobile parts and have been among thousands that were not amenable to additive manufacturing—3D printing—a difficulty that has been solved by the HRL researchers. An added benefit is that their method can be applied to additional alloy families such as high-strength steels and nickel-based superalloys difficult to process currently in additive manufacturing. “We’re using a 70-year-old nucleation theory to solve a 100-year-old problem with a 21st century machine,” said Hunter Martin, who co-led the team with Brennan Yahata. Both are engineers in the HRL’s Sensors and Materials Laboratory and PhD students at University of California, Santa Barbara studying with Professor Tresa Pollock, a co-author on the study. Their paper 3D printing of high-strength aluminum alloys was published in the September 21, 2017 issue of Nature. Photo by Bryan Ferguson. © 2017 HRL Laboratories. Additive manufacturing of metals typically begins with alloy powders that are applied in thin layers and heated with a laser or other direct heat source to melt and solidify the layers. Normally, if high-strength unweldable aluminum alloys such as Al7075 or AL6061 are used, the resulting parts suffer severe hot cracking—a condition that renders a metal part able to be pulled apart like a flaky biscuit. HRL’s nanoparticle functionalization technique solves this problem by decorating high-strength unweldable alloy powders with specially selected nanoparticles. The nanoparticle-functionalized powder is fed into a 3D printer, which layers the powder and laser-fuses each layer to construct a three-dimensional object. During melting and solidification, the nanoparticles act as nucleation sites for the desired alloy microstructure, preventing hot cracking and allowing for retention of full alloy strength in the manufactured part. Photo by Michele Durant. © 2017 HRL Laboratories. Because melting and solidification in additive manufacturing is analogous to welding, HRL’s nanoparticle functionalization can also be used to make unweldable alloys weldable. This technique is also scalable and employs low cost materials. 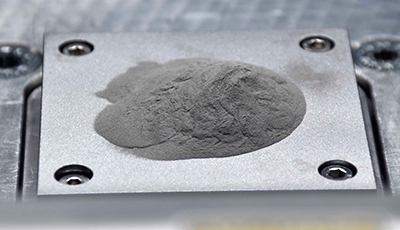 Conventional alloy powders and nanoparticles produce printer feedstock with nanoparticles distributed uniformly on the surface of the powder grains. “Our first goal was figuring out how to eliminate the hot cracking altogether. We sought to control microstructure and the solution should be something that naturally happens with the way this material solidifies,” Martin said. To find the correct nanoparticles, in this case zirconium-based nanoparticles, the HRL team enlisted Citrine Informatics to help them sort through the myriad possible particles to find the one with the properties they needed. 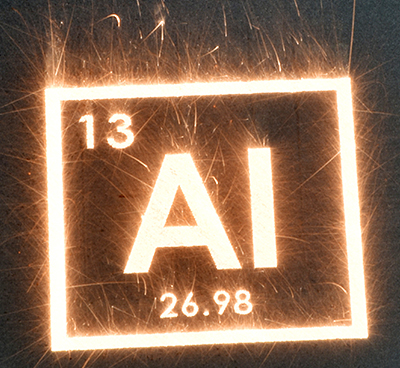 With this exciting new technique, HRL stands at the forefront of a new chapter in additive manufacturing of metals for research, industry, and defense. Other authors on the paper were Jacob Hundley, Justin Mayer, and Tobias A. Schaedler all of HRL.